Adoptive immunotherapy with cyclophosphamide (Cy) increases the host resistance against tumor growth. The precise mechanism(s) by which this therapy enhances tumor suppression is unclear. Cy induces the development of early myeloid cells that may be strongly antiproliferative through NO production. These cells are similar to the natural suppressor cells found in normal bone marrow with a potential antitumor effect. Here we have addressed whether the development of NO-producing cells may be involved in this tumor resistance in Cy-treated mice. The results show a synergism between Cy treatment and tumor-specific lymphocytes transferred systemically (i.v.) or locally (Winn’s assay) that results in a strong tumor suppression. Inhibition of NO production by NG-monomethyl-l-arginine at the site of tumor inoculation results in a loss of the protection achieved by the combined therapy. Cy-treated mice develop splenic early myeloid (CD11b, Gr-1, CD31 (ER-MP12), ER-MP20, ER-MP54) cells producing large amounts of NO upon T cell-derived signals (IFN-γ plus CD40 ligation) able to inhibit tumor cell growth in vitro. Early myeloid cells (ER-MP54+) and cells expressing inducible NO synthase are increased at the site of tumor challenge in mice treated with the combined therapy, but not in those treated with Cy or immune cell transfer alone. Thus, Cy induces the expansion of early myeloid cells, inhibiting tumor cell growth by a mechanism involving NO. Both the recruitment and the activation of these myeloid cells at the site of tumor challenge appear to be dependent on the presence of tumor-specific lymphocytes. Cyclophosphamide (Cy)3 is a DNA alkylating agent with striking immunomodulatory properties that are widely exploited in cancer immunotherapy in protocols for cancer vaccination (1) or in adoptive immunotherapy regimens (2). Cy synergizes with adoptive cell therapy in different experimental tumor models resulting in an enhancement of the host antitumor response (2, 3, 4, 5). However, the cellular basis accounting for the synergism of the combined therapy remains obscure. Early studies pointed to Cy as a quite selective inhibitor of suppressor T cells putatively induced in tumor bearers (6). More recently, an alternative hypothesis has been proposed based on the release of growth factors due to the rebound events linked to Cy-induced myelosuppression (7, 8). In this way Cy would promote the survival and expansion of the transferred T cells in the Cy-treated host. In contrast, the ultimate effector mechanism(s) by which this therapy exerts its antitumor effect in Cy-treated animals is also unclear, because very low numbers of cytotoxic cells are found associated with CD4+/CD8+ T cell populations in mice otherwise cured following the combined therapy (9). It has been shown that Cy induces the development of suppressor cells in the spleens of mice 1–2 wk after drug administration (10, 11, 12). These cells appear to be related to those wheat-germ agglutinin (WGA)-positive cells described in normal bone marrow mediating natural suppressor activity (13). This activity is also found in the spleens of mice undergoing graft-vs-host reactions (14), after total lymphoid irradiation (15), or in mice bearing advanced tumors (16). Natural suppression is defined functionally because of its strong inhibition of lymphoproliferative responses (13, 14, 15, 16). However, it may also inhibit the proliferation of other cell types, including those of tumor origin (17, 18). In most instances this suppressor activity is nonconstitutive, but is induced upon proper cell activation (19). In this regard T cell signals have been described to play a critical role (20, 21). Previously, we have shown that bone marrow-derived natural suppressor activity is mediated by NO (22), which is produced in large quantities by early myeloid cells following IFN-γ plus CD40 stimulation (23). Similar cells have been described recently to be expanded in Cy-treated mice (24). The potent tumoricidal activity of NO (25) makes it conceivable that an antitumor effect of early myeloid cells developed upon Cy treatment might occur, provided that proper T cell signals are given. Production of NO in Cy-treated animals is supported, because this agent has been involved in the pathogenesis of conditions associated with Cy treatment (26, 27, 28). Here we have assessed the effect of Cy plus tumor-specific lymphoid cell transfer on the tumorigenesis of a mouse mammary carcinoma (Ehrlich tumor (ET)). The results show that mice subjected to this combined therapy become resistant to ET cell challenge by a mechanism involving NO production. This production is associated with the development of early myeloid cells, which are located at the site of tumor challenge in these mice. Female F1 (C57BL/6J × DBA/2) mice (8–10 wk old) were obtained from the Experimental Unit, Hospital Clínico San Carlos (Madrid, Spain). Cy, WGA-FITC, streptavidin-FITC, streptavidin-PE, and mouse rIFN-γ (<0.1 ng/μg endotoxin) were purchased from Sigma (St. Louis, MO). Percoll was obtained from Pharmacia (Uppsala, Sweden). NG-monomethyl-l-arginine monoacetate salt (LMMA) was obtained from Calbiochem (San Diego, CA). S-nitroso-N-acetyl-d,l-penicilamine (SNAP) was purchased from Alexis (Laufelfingen, Sweden). Mouse Ly-6C (FITC-conjugated rat IgG2a, ER-MP20 mAb) staining the cell surface of murine midstage macrophage precursor cells (29), CD31 (PECAM-1, biotinylated rat IgG2a, ER-MP12 mAb) staining the cell surface of murine early stage myeloid precursor cells (29), and ER-MP54 (rat IgG1 mAb) staining the cytoplasm of murine early stage myeloid precursor cells (29) from BMA (Augst, Switzerland) were used. FITC-conjugated rat anti-mouse Ly-6G (GR-1) mAb, purified rat anti-mouse CD16/CD32 mAb (Fc blocking), and biotinylated isotypic control mAbs (rat IgG2a, rat IgG1) from Caltag (San Francisco, CA) were also used. Mouse CD40 agonistic mAb (30) (purified rat IgG2a, 1C10; <4 endotoxin units/mg endotoxin contamination) was provided by A. W. Heath (Sheffield, U.K.). Rabbit anti-mouse inducible NO synthase (iNOS) was supplied by Alexis. The hyperdiploid strain of ET was used. ET cells growing exponentially were collected from culture flasks and washed twice with HBSS, and viable cells (trypan blue dye exclusion) were counted. Cells were inoculated i.m. (5 × 105) in the left groin or, eventually, in the footpad of mice as indicated. 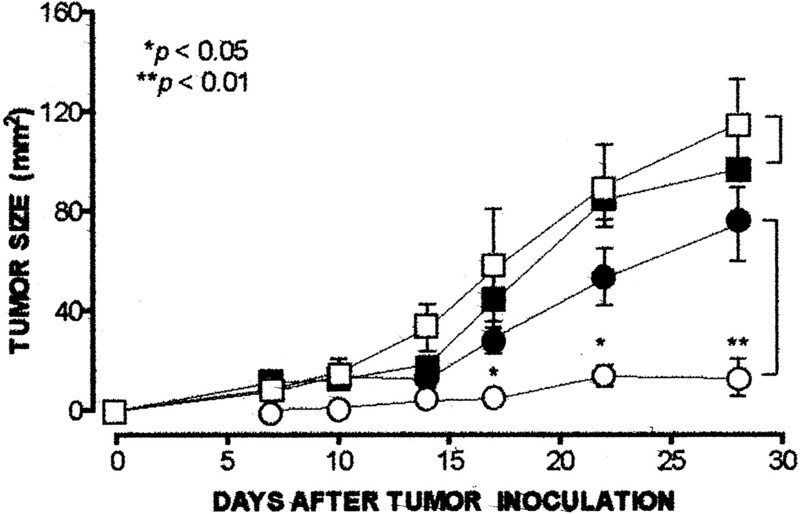 In some experiments 5 mg of LMMA was administered locally in 25 μl at the site of tumor inoculation. This was done the day before tumor challenge and 10 days thereafter daily to inhibit NO production in vivo (31). Tumor size was estimated by calculating the product of two perpendicular diameters measured with Vernier calipers. Mice were immunized with three i.p. inoculations of irradiated (30 Gy) ET cells (107) once a week and used 10 days after the last dose. Spleen cells from immunized or control mice were prepared by gently pressing aseptically removed spleen through a 60-mesh stainless steel screen. Red cells were lysed with distilled water, and after a washing step, cell viability (>90%) was determined by trypan blue dye exclusion. Mice were treated with Cy and transferred with immune spleen cells following the protocol described by Proietti et al. (7) with slight modifications. Briefly, Cy was reconstituted with sterile PBS and injected i.p. (0.5 ml) to mice at 200 mg/kg (day 0). Five hours later, a cell suspension (0.1 ml) containing 108 immune or control spleen cells plus 2 × 105 irradiated ET cells was injected i.v. This cell transfer was repeated 6 days later. On day 7 mice were challenged (i.m.) with viable ET cells. In some experiments immune cell transfer was conducted as a Winn’s assay. Thus, control or immune spleen cells (5 × 106) were mixed with viable ET cells (5 × 105) in 0.1 ml and inoculated to mice treated, or not, with Cy 7 days before. Fr3 spleen cells were obtained from spleens of Cy-treated or control mice exactly as described previously (16). Briefly, plastic nonadherent cells obtained after overnight incubation were fractionated in discontinuous Percoll density gradients. The low density cell fraction banding between 50 and 60% of Percoll was referred to as Fr3, and the other cell fractions banding between higher densities (60–70 and 70–100%) were referred to as Fr2 and Fr1, respectively. Immunofluorescence was performed using 200 × 103 spleen cells (erythrocyte free). Cells were preincubated in 50 μl of PBS, 0.1% azide, and 25% normal rat serum (30 min at 4°C). A saturating amount of labeled mAb or adequate isotypic controls were added at a final concentration of 10 μg/ml to the samples to be tested. Cells were incubated (30 min at 4°C) in the dark and washed. If necessary (e.g., when using biotinylated mAbs), cells were incubated with FITC- or PE-conjugated streptavidin for an additional 20 min. After a final washing step, the cells were fixed in PBS/1% paraformaldehyde and assayed in a flow cytometer (EPICS XL; Coulter, Miami, FL). In some experiments the cells were stained intracytoplasmatically with ER-MP54 mAb using a cell permeabilization kit (Fix & Perm; Caltag, Burlingame, CA). In all cases nonspecific staining was controlled by isotypic-matched Abs, and this background was subtracted from results. Cell cultures were performed with spleen cells derived from Cy-treated mice to assess NO production under different stimuli. Cultures were conducted in triplicate in 96-well flat-bottom cell culture plates (Costar, Cambridge, MA) by seeding 200 × 103 cells/well in 250 μl of culture medium (RPMI 1640, 10% FCS, 2 mM l-glutamine, 5 × 10−5 M 2-ME, and 80 μg/ml gentamicin). The stimuli used were 1C10 (4 μg/ml) with or without IFN-γ (100 u/ml) added to cultures on day 0. In some experiments proliferation of ET cells (15 × 103/well) was tested in cocultures with spleen cells (20 × 104/well) by measuring thymidine uptake in 48-h cultures as previously described (32). In these experiments the effect of NO on ET cell proliferation was assessed by adding LMMA (0.5 mM), an inhibitor of NO synthesis (22). Proliferation assays with ET cells were also performed in the presence of different concentrations of SNAP, an NO donor agent, added at the start of culture. NO production was estimated by the Griess reaction, measuring nitrite accumulation in 48-h culture supernatants as previously described (22). In proliferation assays supernatants were recovered before cell harvesting. Histological studies were performed with hematoxylin-eosin and immunoperoxidase as previously described (33), using ER-MP54 or anti-iNOS on frozen sections obtained 2 or 6 days after tumor challenge. Quantitative studies of the immunohistochemically stained tissue sections were performed by an external pathologist in a fully blind manner on replicates of three or more coded samples. Cell counting was conducted using an image analyzer system (Q 500IW; Leica, Cambridge, U.K.) on 22 × 103 μm2. Data were analyzed using Microsoft Excel (Seattle, WA). Experimental differences from the controls were assessed by Student’s t test. p > 0.05 was considered nonsignificant. The experiments were conducted with groups of six mice per treatment, and at least three independent experiments were conducted to assure that the results were representative. ET growth was assessed in mice treated with Cy 7 days before ET challenge, with or without transfer of immune spleen cells. As shown in Fig. 1⇓, Cy treatment did not inhibit ET development in mice transferred with control spleen cells. Control mice (Cy-untreated) that were transferred with immune cells systemically (i.v.) (Fig. 1⇓A), or locally as a Winn’s assay (Fig. 1⇓B) increased their resistance against ET growth. As shown, in each case this resistance was enhanced significantly if mice were treated additionally with Cy. These results indicated that both Cy treatment and immune cells are required for successful ET suppression. The effect of Cy treatment plus immune cell transfer on ET growth. Groups of six mice were injected i.p. (day 0) with (filled symbols) or without (open symbols) Cy (200 mg/kg) before challenge with viable ET cells (5 × 105). A, Irradiated ET cells (2 × 105) plus 108 immune (circles) or control (squares) spleen cells were administered i.v. 5 h after Cy. This cell transfer was repeated 6 days later; on day 7 mice were inoculated i.m. with ET cells. B, Winn’s assay. ET cells (5 × 105) plus 5 × 106 immune (circles) or control (squares) spleen cells were inoculated i.m. on day 7. Results are the mean ± SD when greater than the symbol. Immature myeloid cells showing natural suppressor activity are found in the spleens of mice treated with Cy (34). As bone marrow-derived natural suppressor activity is mediated by NO produced by early myeloid cells following T cell activation (22, 23), the development of NO-producing cells was assessed in the spleens of Cy-treated mice. As shown in Fig. 2⇓A, large amounts of nitrite, an end product of NO, were present in spleen cell cultures derived from mice treated with Cy. This production was achieved between 7–14 days post-treatment in cultures stimulated with IFN-γ plus 1C10, a CD40 agonist mAb (30). During this time a strong increase in WGA+ cells was seen, and nitrite production was closely associated with their presence in the very same spleens (Fig. 2⇓B). Spleen cells from control mice (Cy-untreated) were <20% of WGA+ cells and were unable to produce nitrite above the detection limits of the assay (3 μM; data not shown). On day 7 after Cy treatment, cells of myeloid lineage were expanded in the spleen, as detected by GR-1 (Ly-6G), CD11b (Mac-1), ER-MP54, ER-MP12, and ER-MP20 markers (Fig. 3⇓). Virtually all NO-producing cells in the spleens of Cy-treated mice that were responding to both IFN-γ plus 1C10 were plastic nonadherent, of low density, and recovered in the Fr3 fraction of Percoll gradients (data not shown). As shown in Fig. 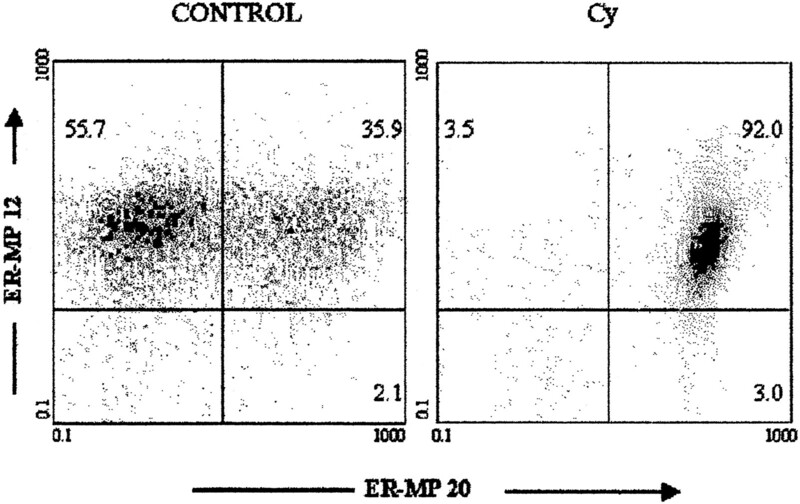 4⇓, almost all (>90%) Fr3 spleen cells from Cy-treated mice were both ER-MP12 and ER-MP20 positive. Taken together these results were consistent with the development of early myeloid cells in Cy-treated mice, which were producing NO upon activation by T cell-derived signals. NO-producing (A) and WGA-positive (B) cells in the spleens of mice following Cy (200 mg/kg) administration (day 0). 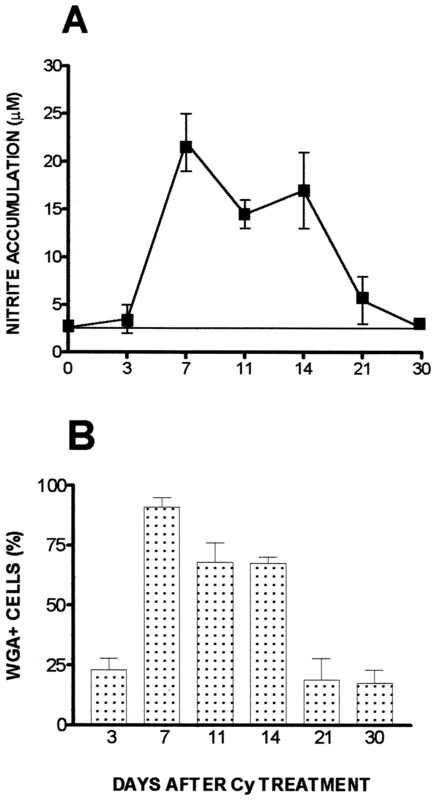 Nitrite was measured in supernatants of 48-h cultures performed with 2 × 105 spleen cells (erythrocyte free) stimulated with a CD40 agonistic mAb (1C10; 4 μg/ml) plus IFN-γ (100 u/ml). The line indicates the detection limit of the assay (3 μM). WGA-positive cells were assessed by flow cytometry. Results are the mean ± SD of three mice assayed for both nitrite production and WGA staining. Comparative analysis of myeloid marker expression in the spleens (erythrocyte free) of normal (control) and Cy-treated mice (200 mg/kg, 7 days before) as detected by flow cytometry. Lines represent the isotypic control cutoff for each staining. Comparative analysis of ER-MP12 (CD31) and ER-MP20 (Ly-6C) marker expression in Fr3 spleen cells derived from normal (control) and Cy-treated mice (200 mg/kg, 7 days before) as detected by two-color flow cytometry. Lines represent the isotypic control cutoff for each staining. Production of NO by bone marrow-derived natural suppressor cells is strongly antiproliferative for lymphocytes (22). As shown in Table I⇓, this was also the case when testing ET cell proliferation in cocultures with Fr3 cells derived from Cy-treated mice. A strong suppression of thymidine uptake was observed in cultures stimulated with exogenous IFN-γ plus 1C10, in which nitrite was accumulated in supernatant. Addition of LMMA, an inhibitor of NO synthesis, to these cultures prevented both growth inhibition and nitrite production, suggesting the involvement of NO in ET cell growth suppression. The sensitivity of these cells to NO was confirmed by adding an NO donor agent (SNAP) to ET cell cultures. As shown in Fig. 5⇓, ET cell proliferation was strongly inhibited when achieving comparable amounts of nitrite as those obtained by Fr3 cells activated with IFN-γ plus 1C10. 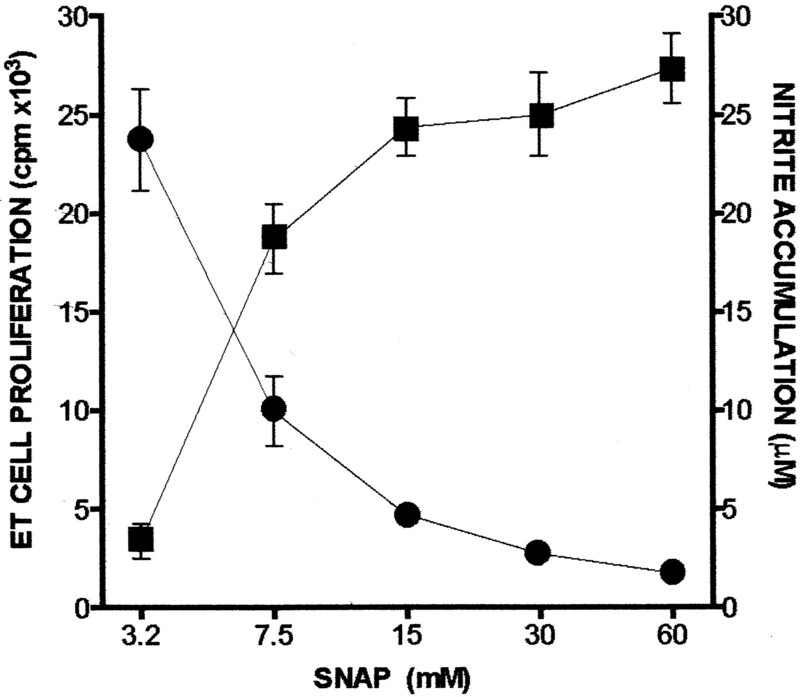 The effect of SNAP on ET cell growth. Increasing amounts of SNAP were added on day 0 to cultures of 15 × 103 ET cells. Nitrite (squares) and [3H]thymidine uptake in counts per minute (circles) were measured in the same cultures after 48 h. Data are the mean ± SD, when greater than the symbols, of triplicate cultures. To test the involvement of NO in tumor suppression achieved in mice treated with Cy plus immune cell transfer, these animals were treated with LMMA at the site of tumor inoculation. As shown in a representative experiment (Fig. 6⇓), ET growth increased significantly in LMMA-treated mice despite the combined therapy. By contrast, no enhancement of tumorigenicity could be seen in control mice (Fig. 6⇓), pointing to NO being involved in the mechanism of host resistance following Cy treatment plus immune cell transfer. The effect of LMMA on the resistance achieved by Cy plus immune cell transfer on ET growth. ET cells (5 × 105) were injected i.m. to normal mice (squares) or mice subjected to the combined therapy (circles) as described in Fig. 1⇑A, with (solid symbols) or without (open symbols) LMMA treatment as described in Materials and Methods. Results are the mean ± SD of six mice per group. To assess whether early myeloid cells could be present at the tumor site in Cy-treated mice, tissue sections obtained 2 or 6 days after challenge with ET cells were analyzed histologically. Fig. 7⇓ shows the results of a representative experiment. As can be seen, a significant increase in cells stained with ER-MP54 mAb was scored in mice treated with Cy plus immune cell transfer. This was the case whether cell transfer was conducted systemically (Fig. 8⇓A) or locally (Fig. 8⇓B). It is noteworthy that this increase was lacking when mice were treated with Cy plus control lymphocytes as well as when cells were treated with Cy or lymphocytes from immune mice alone (Fig. 8⇓). As shown in the same figure, the number of neutrophils, mainly immature forms, increased in most sections from Cy-treated mice regardless of transfer with immune spleen cells. To assess the presence of NO-producing cells at the site of the tumor challenge, sections were also stained for cytoplasmatic iNOS. As shown in Fig. 9⇓, iNOS-positive cells were abundant in tissue sections from mice treated with the combined therapy in a Winn’s assay, but not when treated with Cy or immune spleen cells alone (data not shown). ER-MP54 staining (immunoperoxidase) of tumor sections derived from control mice (A) or mice subjected to the combined therapy (B) as described in Fig. 1⇑A. Note that most cells are negative in A, most of them being of tumor origin (open arrow), whereas in B, many ER-MP54-positive cells (solid arrow) can be seen with rather low numbers of tumor cells (magnification, ×400). The effect of Cy plus cell transfer on myeloid cell infiltration on day 6 after ET challenge (i.m.). Immune spleen cells (ISC) or control spleen cells (CSC) were transferred i.v. (A) or locally (B) as described in Fig. 1⇑. The site of tumor inoculation (footpad) was analyzed histologically for neutrophils (□; hematoxylin-eosin) and ER-MP54 staining (▪; immunoperoxidase) on adjacent sections. Cells were counted on coded samples using an image analyzer system (Leica Q 500 IW) on 22,000 μm2. The results are the mean ± SD of three mice per group. Production of NO by infiltrating inflammatory cells at the site of tumor inoculation 6 days after ET challenge in a Winn’s assay. Mice had been treated with Cy (200 mg/kg) 7 days previously and were inoculated i.m. with 5 × 105 ET cells plus 5 × 106 immune spleen cells. Tissue sections were analyzed by immunohistochemistry for cytoplasmatic iNOS expression. 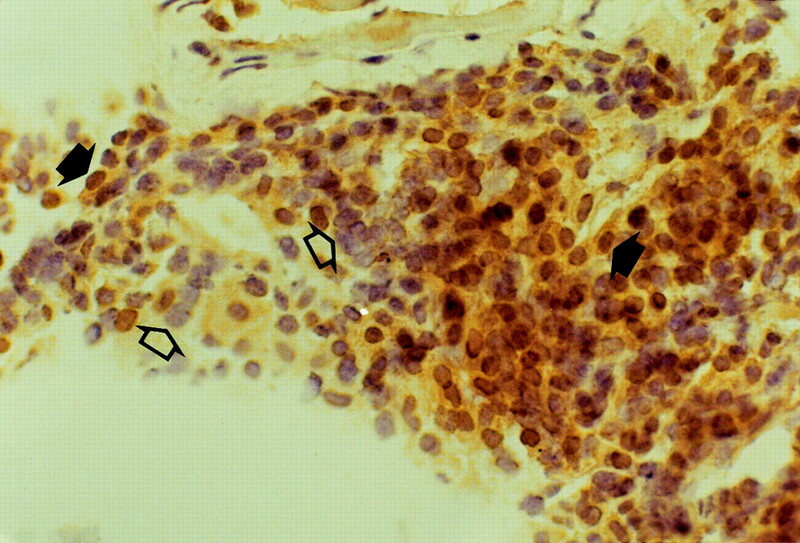 Note the iNOS+ cells (solid arrow) surrounding some negative tumor cells (open arrow; magnification, ×400). Cy is used in adoptive immunotherapy regimes, because it synergizes with the antitumor effect associated with the transferred immune cells (2, 3, 4, 5, 6, 7, 8, 9). This immunomodulating feature of Cy appears to be compatible with the immunosuppressor properties of this agent (35). Whereas this has been explained by arguing that Cy would preferentially act on suppressor cells induced in tumor bearers (6), recent data do not support this view (7). On the contrary, the converse seems to be the case, because Cy induces the development of natural suppressor cells (10, 11, 12, 13, 34). These cells mediate a strong suppressor activity that greatly inhibits lymphoproliferative responses (10, 11, 12, 13, 14, 15, 16, 17, 18, 19, 20, 21, 22, 23). Thus, the mechanism(s) by which Cy enhances the host antitumor immune response is puzzling. Moreover, most studies agree that CD4 cells from the transferred immune cells are truly involved in the synergism associated with the combined therapy (7, 8), but the precise antitumor effector cells involved remain to be elucidated (9). The present study shows, in line with previous descriptions, that a synergism between Cy and spleen cells from mice immunized with tumor cells does exist, resulting in a strong inhibition of tumor growth. It is of note that in the current study Cy was administered 1 wk before tumor challenge, i.e., into tumor-free mice; therefore, its effect on tumor-induced suppressor cells can be ruled out. This agrees with the data reported by Proietti et al. (7), which do not support that the action of Cy is a mere inhibitor of putative suppressor T cells. Instead, these authors suggested that Cy could act by promoting the outgrowth and survival of the transferred lymphocytes by virtue of the cytokine rebound events induced in Cy-treated animals (7, 8). However, this fact alone also seems unlikely in our experimental system, because the effect of the combined therapy was seen when immune cells were coinoculated with tumor cells (Winn’s assay). With this approach the inhibition of tumor growth associated with the combined therapy was evidenced as a very early event, detectable microscopically on the first days after tumor inoculation. Our results show an increase of ER-MP54+ cells infiltrating the site of tumor challenge at very early stages of tumor development. This cytoplasmatic marker is specific for immature myeloid cells (29) and, therefore, demonstrates the presence of these in the site of potential tumor development. Importantly, such an increase was only seen in mice subjected to the combined therapy with immune, but not control, spleen cells, whether administered systemically or locally. Moreover, no increase was seen when mice were treated with immune cell transfer or Cy alone. Nevertheless, Cy alone did induce a rise in early myeloid cells (WGA+, Gr-1+, Mac-1+, ER-MP12+, ER-MP20+, ER-MP54+) in the spleen 1–2 wk after treatment. This indicates that the transferred spleen cells from tumor-immunized mice are required for the recruitment of Cy-induced early myeloid cells at the tumor site. Lymphocytes specific for ET cells are obviously present at the site of tumor inoculation in Winn’s assays and probably following their systemic transfer as described in other tumor models (4, 36). In this regard most studies emphasize that CD4 T cells are the immune cells responsible for the antitumor effect associated with the combined therapy with Cy (5, 6, 7, 8, 9). The fact that these lymphocytes are a rich source of chemokines with activity on monocytes and murine granulocyte-macrophage progenitors (37), such as macrophage inflammatory protein-1α or -1β (38), might explain that ER-MP54+ cell influx. A strong inhibition of tumor growth was observed with the combined therapy. Although the present results do not make clear the actual involvement of Cy-induced early myeloid cells in tumor suppression, some findings point in this direction. First, the results show that early myeloid cells developed after Cy treatment may strongly inhibit ET cell growth in vitro. This inhibition was mediated by NO released by ER-MP12+ ER-MP20+ spleen cells (Fr3 cells) upon their activation with IFN-γ plus CD40 ligation, i.e., T cell-derived signals. This fits with the ability of bone marrow-derived early myeloid cells (ER-MP12+ ER-MP20+) to release large amounts of NO following this activation (23) and with a recent study that reports similar findings when assessing the spleens of mice treated with Cy (24). The fact that LMMA administered at the site of tumor inoculation results in a loss of tumor resistance supports the involvement of NO in the tumor inhibition mechanism. In this sense, iNOS-positive cells were found only in tissue sections containing high numbers of ER-MP54+ cells, i.e., in mice subjected to the combined therapy. It should be noted that ET cells, although sensitive to NO as we show here, are highly resistant to NK activity (32) and probably to CD8-mediated cytotoxicity because of their lack of H-2 Ags (39), a feature often described in tumor cells (40). Moreover, spleen cells from ET-immunized mice were completely unable to inhibit ET cell growth in cocultures performed in vitro (data not shown). Therefore, the current results suggest that Cy, which mobilizes and expands hemopoietic progenitors from bone marrow (41, 42), induces early myeloid effector cells that may inhibit tumor cell growth by releasing NO upon activation. The transferred immune spleen cells might have a double role in this task, as they could be required not only for effector cell recruitment but also for effector cell activation at the tumor site. This latter is consistent with the fact that early myeloid cells are CD40+ and produce NO following T cell signals (23, 24). Neutrophils are also present in Cy-treated mice with a progressive growing tumor; therefore, their active role in tumor suppression seems to be limited. Nevertheless, they might act in conjunction with NO-producing cells in those mice subjected to the combined therapy, for example by producing superoxide anion, which in the presence of NO forms peroxynitrite, a highly reactive oxidant with strong cytotoxic properties (43). In fact, such a mechanism has been described recently to explain some pathogenic effects of Cy following allogeneic bone marrow transplants (27), and NO has been involved in the pathogenesis of Cy-induced hemorrhagic cystitis (26). The above results may suggest that inhibition of tumor cell growth should be enhanced in other conditions where outgrowth of immature myeloid cells is seen, e.g., in those described for natural suppressor cell induction, provided that T cell signals are given. In this regard, natural suppressor cells are also induced following irradiation (14, 15), which, not surprisingly, is an alternative conditioning regimen for adoptive immunotherapy (44, 45). It is noteworthy that radiation-induced enhancement of antitumor immunity has been suggested, in common with Cy, to be dependent on suppressor cell removal (44), a fact not supported by other studies (45). Graft-vs-host disease is another condition where natural suppressor cells are developed (14). This condition is associated with the graft-vs-leukemia effect, because it is greatly impaired in their absence (46). Moreover, IL-2 enhances the anti-leukemia effect of T cell-depleted allografts (46). Because this cytokine expands myeloid progenitors (47), a cell population with IL-2R (48), and activates bone marrow-derived natural suppressor cells (21, 49), the antitumor effect of these cells should also be considered. Reports associating the antitumor response of IL-2 therapy with NO production (50, 51) or describing an antitumor synergism between Cy and IL-2 (52) are consistent with this hypothesis. Finally, another condition in which natural suppressor cells are expanded is in the late stages of tumor development (16, 53, 54, 55), probably due to stimulation of myelopoiesis in tumor bearers (56, 57). Thus, tumor-induced natural suppressor cells might potentially inhibit tumor cell growth, as described for those suppressor cells found in normal bone marrow (17, 18) or like those shown here. Hence, natural suppressor cells with features of early myeloid cells are found infiltrating progressively growing tumors, associated with impaired antitumor responses (54, 58). However, these cells release small amounts of NO (54), which may indicate poor cell activation and/or a down-regulation of NO production, e.g., by tumor-derived factors such as TGF-β (59, 60). Production of NO by these cells may not be impaired in the very early stages of tumor development, in which rather low local concentrations of inhibitors should be expected. However, in these early stages tumor-induced specific responses and natural suppressor cells have not yet been developed (16, 53). This may not be the case if a second inoculation of tumor cells is conducted in animals bearing an advanced tumor. 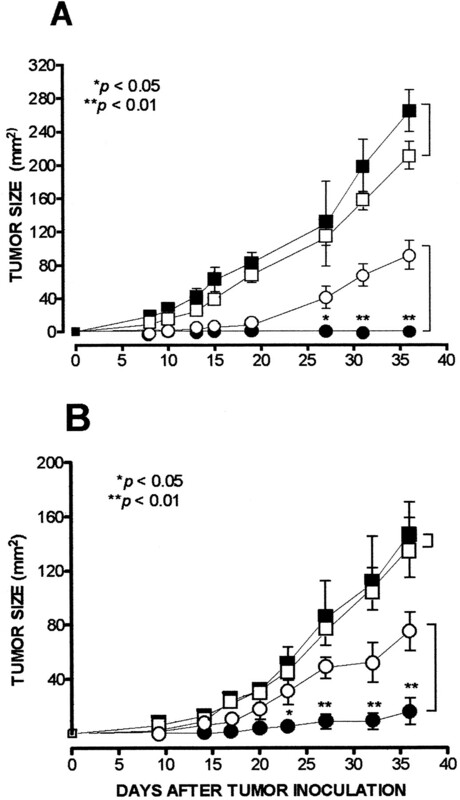 This latter might account for the still unexplained phenomenon of concomitant tumor immunity, i.e., the resistance of secondary tumor challenge vs the progressive growing primary tumor described in mice bearing large tumor burdens (61, 62). The facts that concomitant resistance is a very early event after the second tumor inoculum, that it has been associated with a strong monocyte/macrophage infiltration (63, 64), and that it is sensitive to LMMA treatment (B. Peláez, unpublished observations) appear to support this view. We thank Pablo González and Dr. Paloma Argancillo (Hospital Clinico San Carlos, Madrid, Spain) for their technical assistance. We also thank Dr. A. W. Heath (University of Sheffield, Sheffield, U.K.) for providing 1C10. ↵1 This work was supported by Fondo de Investigaciones Sanitarias Grant 99/0481 (to J.L.S.). ↵3 Abbreviations used in this paper: Cy, cyclophosphamide; ET, Ehrlich tumor; Fr, Percoll spleen fraction; LMMA, NG-monomethyl-l-arginine monoacetate salt; SNAP, S-nitroso-N-acetyl-d,l-penicilamine; iNOS, inducible NO synthase; WGA, wheat-germ agglutinin. Maier, T., J. H. Holda, K. L. Choi, H. N. Claman. 1989. Characterization and function of the natural suppressor cells systems. C. W. Reynolds, and R. H. Wiltrout, eds. Functions of the Natural Immune System 267 Plenum Press, New York. Chabner, B. A., C. J. Allegra, G. A. Curt, and P. Calabresi. 1996. Antineoplastic agents. In The Pharmacological Basis of Therapeutics, 9th Ed. Goodman & Gilman’s, p. 1233.